With growing sales of electronics, the demand for power semiconductor components continues to witness an upsurge. Key role of components consisting specific type of metal oxide semiconductor field effect transistors (MOSFETs) in the working of electronic devices continues to influence the future landscape of the global semiconductors industry. Considering the diversity in power consumption and functionalities of electronic devices, companies are designing power MOSFETs by catering to the wide range of power levels and device usability. Moreover, the demand for power MOSFET is being bolstered by their growing use in replacing insulated-gate bipolar transistors and thyristors. Manufacturers of electronic devices are actively adopting power MOSFET to increase the efficiency of operations involving high switching speeds. In addition, the key advantage of using power MOSFET in bolstering the power efficiency of devices at low voltages is further fuelling the expansion of the global power MOSFET market. According to a newly published report by Transparency Market Research, the global market for power MOSFET is expected to grow robustly at a CAGR of 7.8% during the forecast period, 2017-2026. The report estimates that by the end of 2026, nearly US$ 12.6 Bn worth of power MOSFET will be sold in the global market. Leading power MOSFET manufacturers are expected to focus on lowering the complexities entailing the production of these intricate power semiconductor components. Over the forecast period, the entire production of power MOSFET in the global market will remain concentered in the Asia-Pacific excluding Japan (APEJ) region. Favorable industrial regulations in countries such China, India and South Korea, coupled with increasing production of electronic devices in this region is expected to drive the production of power MOSFET. By the end of forecast period, more than US$ 7 Bn worth of power MOSFETs will be sold in the APEJ market. The report estimates that in 2017, nearly US$ 4 Bn worth of P-channel power MOSFET have been sold in the global market. Over the forecast period, the sales of P-channel power MOSFETs will gain fastest traction, register a CAGR of 8.2%. The report further reveals that power MOSFETs for medium power rating will register highest sales in 2017 and beyond. By the end of 2026, sales of power MOSFETs with medium power rating will account for nearly 40% of the overall sales in the global power MOSFET market. The report has projected that the demand for power MOSFET will be highest in production of EV and EHV components. Through 2026, global sales of power MOSFETs in EV and EHV component applications is estimated to reach US$ 3.7 Bn valuation. The report also reveals that telecom equipment will be the fastest growing application in the global power MOSFET market, registering 10.2% CAGR over the forecast period. With respect to technology, power MOSFETs developed on SiC technology are expected to account for largest revenue share in the global market through 2026. On the other hand, the demand for GaN-based power MOSFET will gain fastest traction over the forecast period. Leading manufacturers of power MOSFET have been profiled in the report. These include companies namely, Infineon, Renesas, Panasonic, Mitsubishi Electric, Toshiba, Hitachi, STMicrorlectronics, Bosch, Sumitomo Electric, and Raytheon. These companies are expected to remain active in the global power MOSFET market expansion for the forecast period. As the global production of electronic devices continues to gain traction, the demand for semiconductors and components witnesses an upsurge. Increasing complexities in the design of electronic devices has propelled the miniaturization of semiconductor components. The role of metal oxide semiconductor field effect transistors (MOSFET) in the operational workflow of electronic devices has bolstered its demand, particularly with respect to controlling the power consumption of the device. The demand for power MOSFETs continues to incur steadfast growth as their advantage in high speed switching applications renders them highly important commodity in the semiconductors industry. 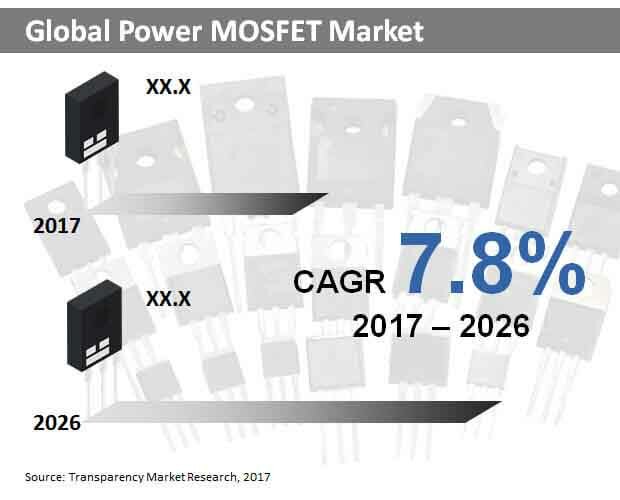 Transparency Market Research’s latest study on the global market for power MOSFET discusses such factors and draws a forecast based on an in-depth analysis. The report provides analysis on the expansion of the global power MOSFET market, and offers a forecast on market size growth for the assessment period, 2017-2026. The report has been developed to cater to the difficulties faced by players in the global power MOSFET market. Local companies and industry leaders, both, can avail the benefits of this report by referring to the inferences that connect valuable insights with market size estimations. Key chapters in the report provide segmental analysis and forecast on the global power MOSFET market, on the basis of channel type, power ratings, application, technology and region. Additional data on cross-segmental analysis and country-based market size forecast is also delivered in the study. Transparency Market Research has developed this report by employing robust research methodologies. Primary research has been conducted to interview the market players, understand their woes, and assess their revenues for the past historic period. Secondary research has been directed to validate this data and generate qualitative insights based on changing industrial regulations, geopolitical diversity, and developments in terms of technology and product design. The report has provided analysis on pricing of power MOSFETs, the cost structure involved in their production, and the global semiconductor supply chain. A detailed competition assessment is the highlight of the report. An intensity map provided in the report demarks that presence of market players across different global geographies. Companies have been profiled in an unbiased manner, considering their current market standings and strategic developments. The report has created insights on how the manufacturers can plan their next steps towards future market directions. Inferences provided the report can enable market players in assessing the subjective undercurrents of the global power MOSFET market. The report also provides information on best strategies in terms of raw material procurement. Lucrative regional markets, sought-after technologies, and changing consumer behaviors have been analyzed in the report to create holistic outlook on the future of the global power MOSFET market. The scope of the report is create credible information that supports the strategies being developed by market participants. This information can help companies enter the global power MOSFET competition landscape, and also bolster the business development of existing players to tackle the growing participation.